Reuben is the newest addition to Alpha and Rev's household. 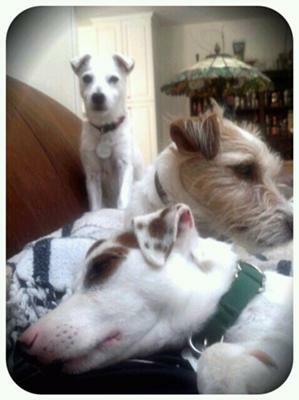 Alpha is the perky little 14 yo standing and Reuben is in the forefront napping with Rev. Rueben is for adoption thru Russell Rescue. Those three look so comfortable together! I hope Reuben finds a forever home soon!